This issue of the Rotaryite is somewhat massive for a “newsletter”. It goes back to the first of July, 2013, when President Juan Proano took office. As you will see if you are not already aware, this is a very active club that does some pretty remarkable things. Juan, a mining engineer, skilled executive, and consultant, has brought a wonderful dimension to the club’s service by leading the Peru Water Filter Project. Some exciting new local service projects are being developed, in part to better reach out to the people in the Yardley area. 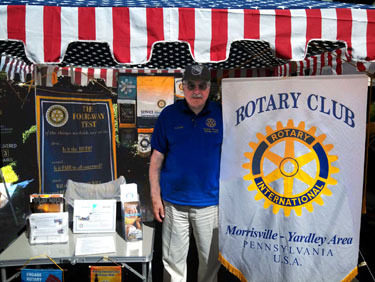 And the fund raisers are undergoing a transition which promises to generate not only more money but more interest throughout the community and raise the awareness level of what Rotary is and what the Morrisville-Yardley Area Rotary Club does. Bill and Jo Anne Pepitone, the newest members, have volunteered to be the new administrators of the website and the Facebook page and handle publicity. They already are bringing a fresh look to the club’s media image and that is sure to help attract more people as candidates for membership and increase support of the fundraisers and service projects. With more new members who are ready to begin “giving back” and who are nurtured by those of us “with experience”, there is no doubt in my mind that the club has a very bright future. One other thought. As, generally, the recorder and editor of the dinner speaker remarks, I have always struggled with how much detail to provide in the articles. I lean strongly toward trying to capture the content and essence of the remarks rather than just noting that someone from someplace said something. So I invite you to give the material a good read, whether to refresh your memory or to inform you of that which you missed. The dinner speakers have always been excellent, with special thanks to Andy Thompson, the Programs Chair, and to Linda Yonkin who filled in recently in his absence, and I’m willing to bet that you will find the time spent reading this issue worthwhile. A gift is not a gift unless you give it with your heart. 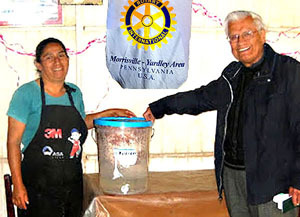 Club President Juan Proano of Washington Crossing, is shown with a happy Lima, Peru, recipient of a water filer that is providing safe drinking and cooking water. Through his special efforts over $43,000 was raised recently for water filters to support some 6000 people in shantytowns around Lima, Peru, who lack access to safe water. 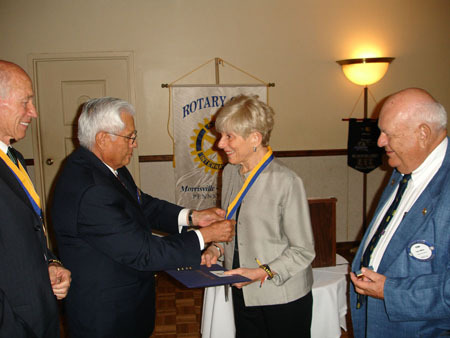 This was an international effort with funding from a combination of individual Rotarians, Rotary clubs in Bucks County (Morrisville-Yardley Area, Ambler, Newtown, Bethlehem Morning Star and Doylestown) and Peru (Sunrise), the Rotary Districts of 7430 (Bucks County) and 4450 (Peru) and The Rotary Foundation. Note that previously, the Morrisville-Yardley Area Club and the Sunrise Club in Lima, Peru, together had raised funds that provided water filters for over 4,000 people, making a total of over 10,000 people served thus far by this project. The theme of Service Above Self, or as some like to view it as “Giving Back”, also was served through Rotarians volunteering at the Trenton Area Food Kitchen, ringing the Salvation Army Christmas collection bells and forming a Canal Tenders group that is periodically picking up trash along the Delaware Canal towpath in Lower Makefield and Morrisville. The club is providing Children’s Dictionaries to third-graders in the Morrisville schools and recognized the service of others through its annual Boy Scout and Girl Scout Leaders Banquet. 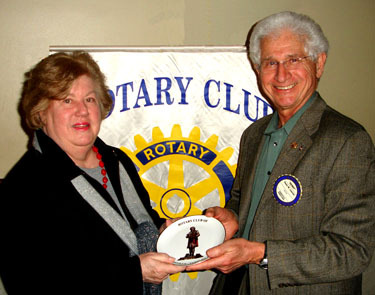 An estimated $7000 in individual and club donations were made to End Polio Now, Rotaplast, ShelterBox and The Rotary Foundation. Work in progress includes the provision of Pedestrian Signs for the Canal Towpath and the Landmark Towns of Yardley and Morrisville, planning for a Community Garden at the Grandview Elementary School site, left bare by the removal of the temporary classrooms, and the installation of commemorative bricks in the Rotary Recognition Garden in Morrisville’s Williamson Park. 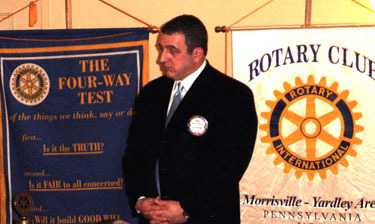 Fun fundraisers coming up include the new River Towns Road Rally (April 19), which is in cooperation with Landmark Towns http://www.landmarktowns.com/events/?id=399, and the Morrisville Carnival (May 13-18) http://www.morrisvillecarnival.com/. 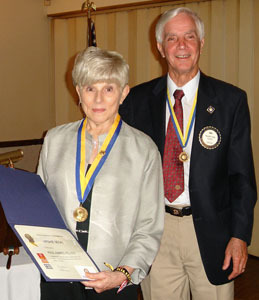 Heshie Segal of Lower Makefield and Doug Miller of Pennsbury Manor were named Paul Harris Fellows and Heshie, her husband Werner Berger and Past President Jimmy McNally were made Honorary members. New members Bill and Jo Anne Pepitone of Morrisville were welcomed and have volunteered to administer the club’s website, develop the club’s new Facebook page and handle publicity. Dinner speaker was Heshie Segal who spoke on a system of communication and promotion that she has developed called “Jetnetting”. Also she was named a Paul Harris Fellow for her humanitarian work with orphans in Africa and her effort to provide filtering water bottles for children throughout the world. 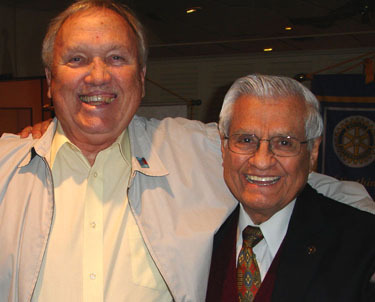 Shown on left is husband Werner “the Everest Guy” Burger who was named a Paul Harris Fellow previously, Club President Juan Proano and Foundation Chair Tom Miller (right). Assistant Governor Janet Mintzer (left), who is President and CEO of Pearl S. Buck International, brought with her a Chinese student, Gecheng Zhang, who was doing an internship at Pearl S. Buck International. He was the dinner speaker and presented his very enlightening views about his home city of Zhenjiang, where Pearl S. Buck called home for 18 years, and life as a high school student in China today. 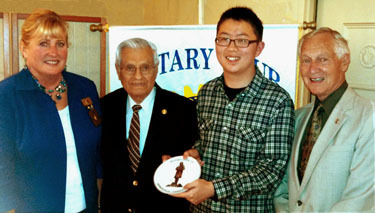 President Juan Proano and Andy Thompson (right) presented Gecheng with a commemorative Robert Morris plate in appreciation of his talk. 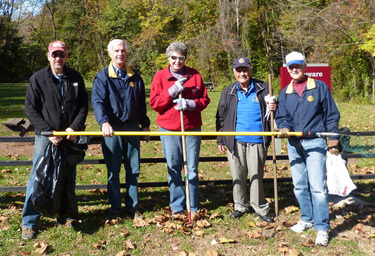 This was an Official Visit by District Governor Frank Romano. He spoke on the District plans and goals and the role our club can play. His wife, Jean, accompanied him. 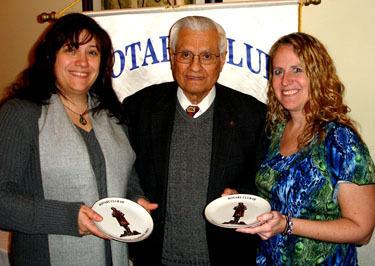 President Juan Proano presenting a Robert Morris commemorative plate to District Governor Frank Romano with his wife Jean. Frank and Jean promoting the upcoming District 7430 Conference scheduled for May 2-4, 2014, at the Bushkill Inn in Bushkill Falls, PA.
Dinner speaker was Rayna Adams who talked about "The Bristol Riverside Theater; Its History and Current Productions". 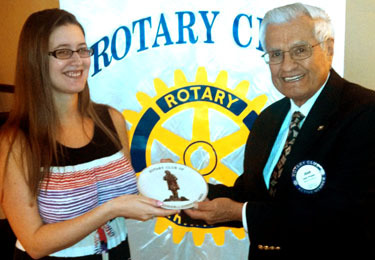 President Juan Proano presented her with a Robert Morris commemorative plate in thanks for her presentation. Rayna said that there is a “mirror neuron” that allows one to grasp another’s point of view through vicarious experience rather than through logical analysis. And that is exactly what “theater” does, she said. It provides the vicarious experiences that let one understand better the viewpoints of others. She also talked about the various good shows coming up. More information about the theater can be found at www.brtstage.org. Dinner speaker was Leonard Miller who talked about the "car-racing business" and his experience in it. He truly was a pioneer in promoting black ownership of racing teams and promoting African-American race car drivers. Born in Philadelphia in 1934, Leonard said his love of automobiles began when he was 5 and as a teenager he built an advanced hotrod. In the military he was assigned to a company whose mission was to repair vehicles under battlefield conditions and the friendships he made there eventually led to his formation of Black American Racers, Inc. (BAR) and Vanguard Racing, Inc. BAR fielded African-American second-generation driver Benny Scott. The team endured corporate sponsorship rejection, due to prejudices and disbelief that a black team could be competitive in auto racing, but after securing sponsorships BAR started road racing and made it to the Long Beach Grand Pre in the mid-1970’s. In 1976 he and Benny Scott were inducted into the Black Athletes Hall of Fame for their pioneering efforts in automobile racing. This was a gala affair with many celebrities and movie stars attending and Bill Cosby serving as the Master of Ceremonies. In 2004 his autobiography, Silent Thunder: Breaking Through Cultural, Racial, and Class Barriers in Motorsports, was published and was enthusiastically endorsed by late actor Paul Newman and racing legends and pioneers including Mario Andretti and Janet Guthrie. Although Leonard did some drag racing in his younger days, he said his knowledge of automobiles and his business sense was more valuable than would have been his driving. He reflected on one race where the team was about to give up due to a mechanical problem that demanded the driver ride the brakes to the point of overheating and probably failure. He knew, however, that the metals involved could stand the extra stress and told them to keep racing, which they did and successfully finished the race. 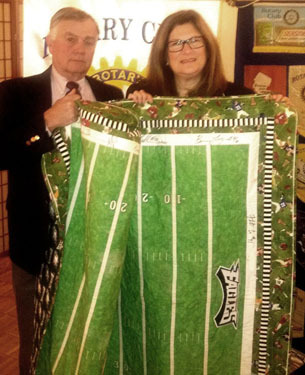 Leonard and his wife reside in Washington Crossing and he currently is working to secure funding for a motion picture of his motor racing experiences. 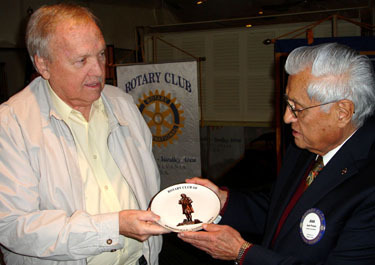 His neighbor and President of the club, Juan Proano, is shown presenting him with a Robert Morris Commemorative plate in appreciation of his talk to the club. Dinner speaker was Patrick Peters, a history buff and researcher of the Titanic disaster, who talked about the ship, the people and the changes that this tragedy brought about. His interest began at age when exploring his grandfather’s attic he found a book on the Titanic that had been published in 1914. It captured his imagination and he has been studying the ill-fated ship ever since. On display was a model of the Titanic which he had built. 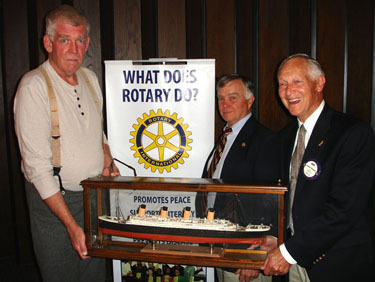 With him in the picture are Rotarians Tom Mack (center) and Andy Thompson. Harvest Day was really two events, one in the borough of Yardley and the other in the township of Lower Makefield at Shady Brook Farm. The Yardley event was run by the Yardley Business Association and the Shady Brook event was run by the Makefield Women’s Association. 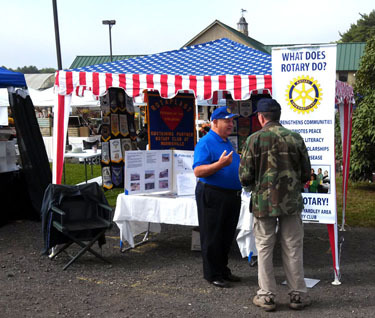 The Rotary booths attracted a number of local residents who wanted to know what Rotary does and expressed interest in in the club. There also were a number of Rotarians and former Rotarians who stopped by to talk. Tom Miller is talking to a visitor at the Shady Brook Harvest Days event. All went well until a mid-afternoon storm blew down the booth! Tom and his wife, Karleen, toughed it out until closing! Claude Magnani was at the Yardley Harvest Day booth. Hal Long who shuttled between the two venues. 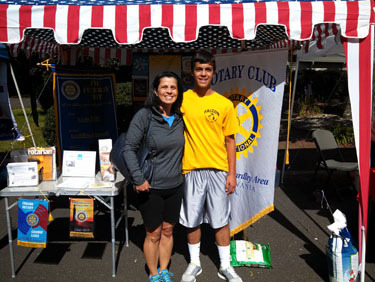 President Juan Proano’s daughter and grandson visited the Yardley booth. Dinner speaker was George Washington in full uniform, aka Sam Davis, who talked about his battles from New York to Princeton and the skirmishes in between (including the little episode in Trenton!). Club President Juan Proano, made a presentation about his recent trip in jungles and mountains of Peru, including photos and descriptions of gold mining operations in the mountains. Of particular interest were the primitive and unsafe mining operations in the mountains that the government is unable to control. 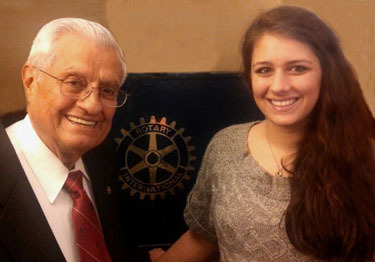 His granddaughter, Erica, assisted in the slide presentation. This was a special “pitch-in” dinner meeting at Pennsbury Manor with spouses and friends invited. Doug Miller (left), Historic Site Administrator, was the dinner speaker and talked about his research into the history of the local Native American tribes. As part of his research he has interviewed Native Americans on reservations in the west whose ancestors were among those forced to move from the eastern part of the country. 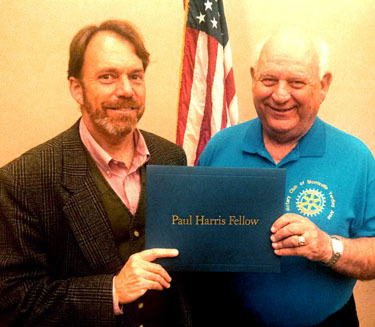 Also Doug was honored as a Paul Harris Fellow. Tom Miller (no relation), the club’s Foundation Chairman, made the presentation. 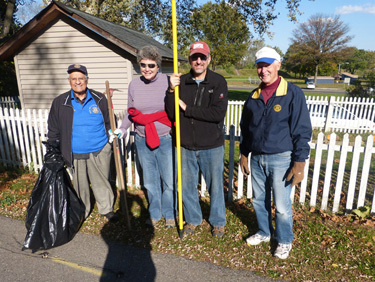 The Morrisville-Yardley Area Rotary Club “adopted” a section of the Delaware Canal Towpath between Black Rock Road in Lower Makefield and Palmer Avenue in Morrisville to periodically pick up trash and retrieve debris from the canal (hence the horizontal pole being held). 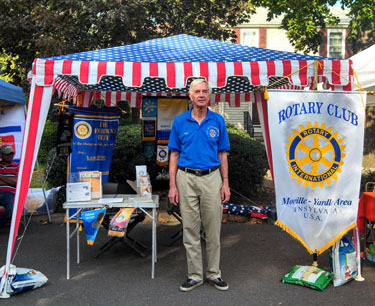 The first outing was a very pleasant event with Rick and Donna Dulay of Morrisville joining as helpers. 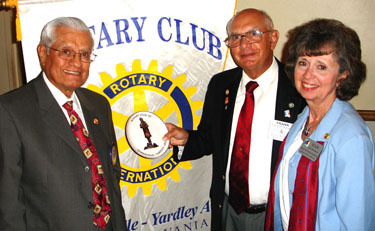 Left to right: Rick, Hal Long, Donna, Juan Proano and Andy Thompson. 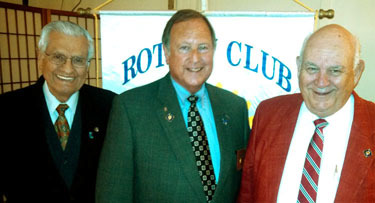 November was The Rotary Foundation Month and Tom Miller (right) arranged for District Foundation Chairman, Roger Baumann (center), to speak about the foundation as to why it needs to be supported and how the grant process works. 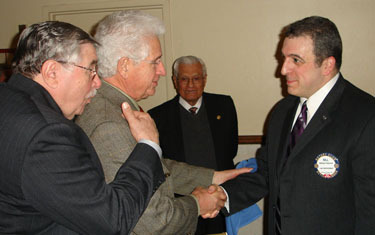 President Juan Proano is shown left. As Roger explained, there are three kinds grants; District Grants, Global Grants and Packaged Grants. District Grants are smaller and shorter term local and international grants funded and administered by District 7430 TRF Committee. Global Grants are larger (greater than $30,000) international partner projects that are more impactful with sustainable outcomes and administered by Rotary Foundation. The club’s Lima, Peru, Water Filter Project is funded as a Global Grant. 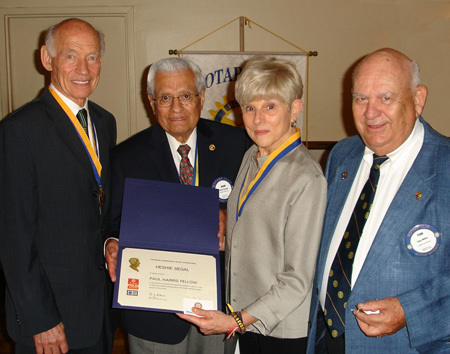 Packaged Grants are pre-funded large grants between Rotary Foundation and its approved strategic partners that Rotarians can participate in. 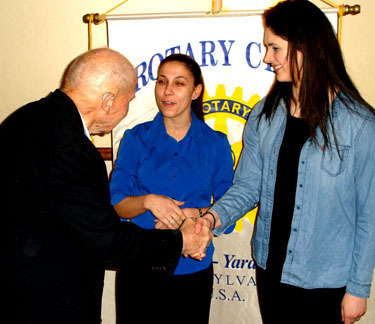 There are two kinds of District Grants, Small and Large, and they are for projects that fall under at least one of the 6 Areas of Focus of the Rotary Foundation. Small Grants are for projects up to $1500. It is expected that these small projects will be focused on local community needs and have a term less than 12 months which includes the submission of the required Final Report. Large Grants are for projects over $1,500 and up to $5,000. Note that for grant requests over $5,000, the proposing group needs to contact the Grant committee chair for guidance before completing their proposal. 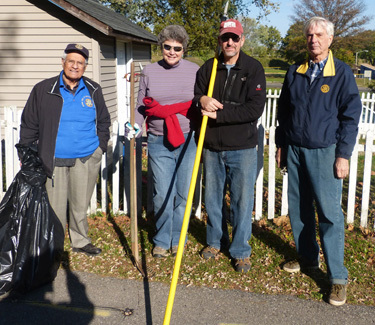 Large Grant projects may have durations of up to 24 months and should involve partnerships among multiple Rotary Clubs, between a Club and one or more community service organizations and/or be initiated by a District Committee. These projects may cover community needs remote from the local community including international locations. Dinner speaker was Chuck Schaefer, Local Country Songwriter and Performer, who talked about the challenges of trying to build a career in the music business and treated the club to some of his songs. He has opened for or shared the stage with Roy Clark, Sonny Landreth, Dr. Ralph Stanley, David Allan Coe, Lisa Marie Presley, Jim Femino, Craig Bickhardt, Larry Siegel, Jim Henry and Lisa Bouchelle, and has been featured on numerous TV, newspaper and radio outlets. Although the music career path is his passion and he has been performing some 100 shows annually, he also is a loving and committed husband to wife Jenny and father of their two daughters and has a full time job. 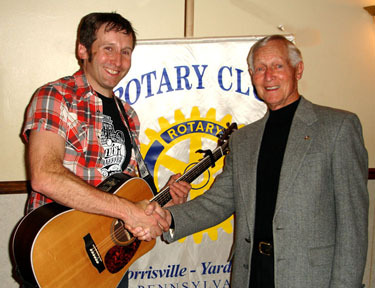 To learn more about Chuck, check out and download his music, see his performance schedule or consider a booking, go to www.chuckschaeffer.com. Club Rotarians once again volunteered to ring the Salvation Army bells at the Christmas donation station outside of the JC Penny store at the Oxford Valley Mall. This was the annual Election of Officers and Members of the Board of Directors for Rotary year 2014-2015. Dinner speaker was Dr. Angelo Ratini who discussed the role of the general practitioner in today's health care environment. This was a special Christmas program that included spouses and friends. Special Christmas entertainment was provided by members of the Pennsbury HS Chamber Choir. The choir includes, Erica (third from the left), one of President Juan’s granddaughters. 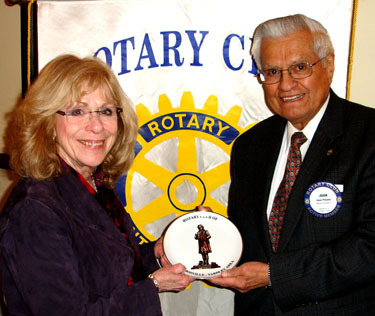 (Juan is on the left and his wife, Rotarian Luisa Proano, is on the right.) 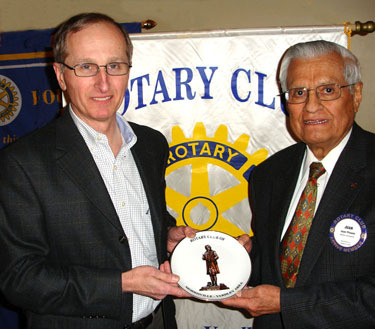 The dinner speaker was Past District Governor Roger Whitcomb who talked about Rotaplast and how it changes lives. The club has been a long-time supporter of Rotaplast which provides free cleft lip and palate surgeries to children in remote parts of the world. More can found at www.rotaplast.org. 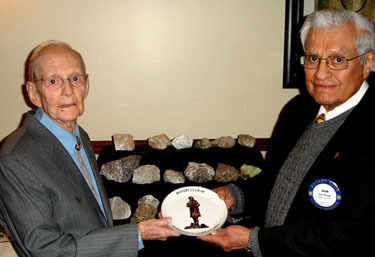 President Juan presented past Governor Roger Whitcomb with a commemorative Robert Morris plate in appreciation of his talk. Dinner speaker was The Honorable Judge Ted Fritsch (right) who explained and discussed the role of the Orphan's Court in today's society. 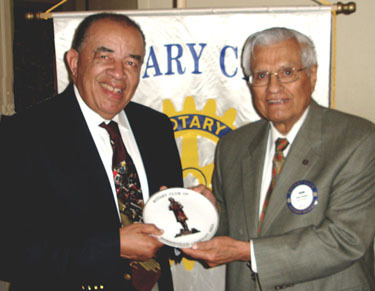 President Juan Proano is shown presenting him with a Robert Morris commemorative plate in appreciation of his talk. The court exists to protect those who cannot advocate for themselves, mainly minors and those with beginning-of-life and end-of-life issues. It handles adoptions, guardianship matters and litigation regarding Powers of Attorney and wills where there are issues involving fiduciaries and settlements. 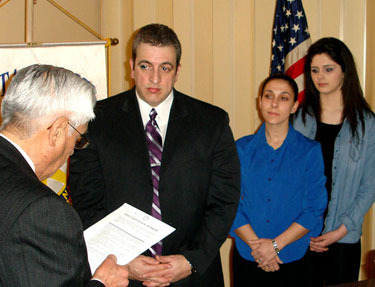 It rules on settlements in wrongful death cases and the validity of marriages. It also rules on the sale and disbandiment of charitable organizations where money is invoved. Judge Fritsch said his greatest pleasure on the bench is presiding over adoptions which generally are very joyous experiences. Dinner speaker was Caroline Unger who talked about the Women's Humane Society located in Bensalem. It is an “open admissions” shelter for small animals and is dedicated to the humane and compassionate treatment of animals. The society provides shelter services, an animal hospital, children and adult education about humane treatment, adoption programs, dog training classes and a cruelty investigation department. It was founded in 1869 by Caroline Earle White who was prompted by the mistreatment of horses in Philadelphia. She joined forces with others to improve conditions for horses and dogs and formed a women’s branch of the Pennsylvania SPCA. Guided by an all-female board of directors, the Women’s Pennsylvania SPCA soon became a force in the humane community. In 1912, the organization opened a small animal shelter, giving homeless cats a chance at new homes. The new shelter offered the country’s first animal adoption program and was a great success that fulfilled an unmet need in the community. In 1988, the name was officially changed to the “Women’s Humane Society.” More information can be found at www.womenshumanesociety.org. Dinner speakers were Barbara May (left), President and founding member, along with Hope Callan, of the Lower Bucks Genealogy Club. The club is dedicated to assisting others in identifying and preserving their family history, and to promote interest in genealogy. They spoke about the increasing interest in tracing one’s family lineage, and the extensive methods and resources available. 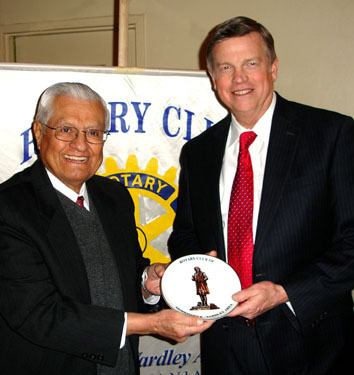 For more information go to http://www.lbgc19047.webs.com/ President Juan Proano presented Robert Morris commemorative plates in appreciation of the talk. 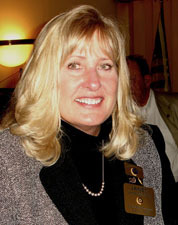 Assistant District Governor, Janet Mintzer, attended the meeting. Note that the snow caused the cancellation of two meetings in February. 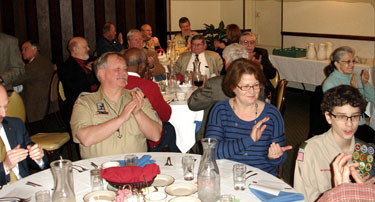 This was the Annual Recognition and Appreciation Dinner for area Boy Scout and Girl Scout leaders. As an added bonus Bill Pepitone was inducted as a new member. 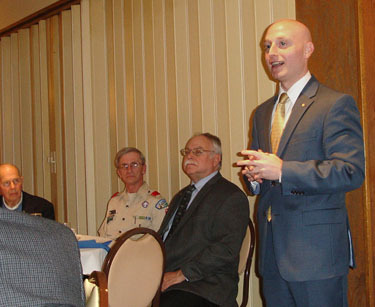 The Morrisville-Yardley Area Rotary Club once again hosted leaders of the local Boy Scout and Girl Scout organizations at its annual banquet honoring their work in building young lives to become responsible citizens and leaders. 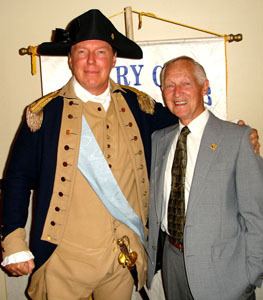 Tyler Yankey, District Director of the Playwicki District of the Bucks County Council, noted that the district had doubled in size to about 9000 young men after absorbing scout units in New Jersey whose district had to cease operations because of lack of funding. Lew Mohr, Vice Chairman of the District Council who has been associated with scouting for over 50 years, introduced Maureen McGovern and her daughter Oona who represented the Girl Scout organizations. Oona is a Gold Awardee, the equivalent to Eagle in Boy Scouts. 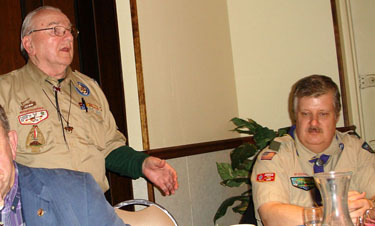 Also on hand were Griffin Goode, an Eagle Scout candidate, and his parents Cynthia and Dan Goode who is the web advisor for the district, Tom Deshields, Advancement Chairman, Bill Burgess, the liaison between the Morrisville Presbyterian Church and the Boy Scout Troop 3, Tim Drews, Scoutmaster, and Bill Pitts, a Playwicki District Commissioner. 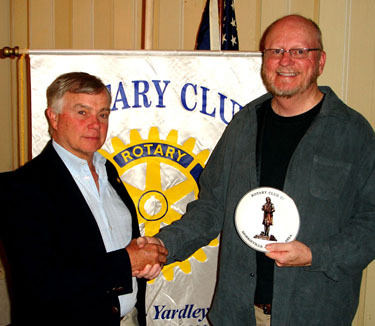 The Morrisville-Yardley Area Rotary Club inducted Bill Pepitone of Morrisville as a new member. Bill is retired New York City police officer who enjoys writing, with two novels and several screen plays to his credit, and is particularly interested in serving the Morrisville community. He is married with two small children at home. Dinner speaker was Bill Pepitone who gave his Classification Speech. Bill is a writer, producer and former NYC policeman who is committed to being of service in his new hometown of Morrisville. 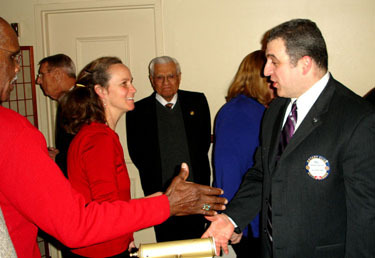 On February 20th, Bill Pepitone was inducted as the newest member of the Morrisville-Yardley Area Rotary Club. 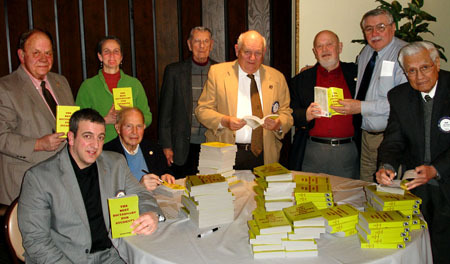 One week later, Bill gave his Classification Speech and described his career as a New York City Police Officer, his passion for writing novels and screenplays, and his motivation to make the Rotary motto “Service Above Self” his own in the Morrisville community where he, his wife and children live. At 17 years old Bill was certified as a peer mediator, helping troubled teenagers deal with the pressures of young adulthood. His efforts led to a meeting with a New York State Senator who subsequently invited him to work on projects and legislation aimed at helping area senior citizens. In 1989 he became a New York City Police Officer and served the public for 20 years. During his career, Bill responded to high profile and dangerous incidents throughout New York City, including the 9/11 attacks on the World Trade Center. However, he described one incident as his most memorable; a young mother who locked herself out of her home with her infant son alone on the third floor looking out the window. Both were hysterical when he and his partner came by. A neighbor had a ladder that would reach the third floor, however Bill had a lifelong fear of heights and his partner was a 300 pound body builder whom the ladder wouldn't have held. Bill climbed the ladder and brought the child down to his mother. The look of appreciation and relief on both the infants and mothers face made it all worthwhile. That, Bill said, is what being a police officer is all about…helping others. Bill has co-written two novels and several screenplays thus far and is once again collaborating with his brother Joseph, an Emmy Award winning writer and producer, on various TV and movie projects. Last year, he ran as a write-in candidate for the Mayor of Morrisville, motivated by wanting to help his community address some of the serious issues being faced. In just six weeks of campaigning, Bill secured nearly five hundred write in votes and finished a strong second in the voting. Encouraged by this, Bill wants to continue to find ways to help and serve in what is now his hometown. At the March 13th meeting of the Morrisville-Yardley Area Rotary Club, Mr. Ralph Thomas, a long-time member of the Rock and Mineral Club of Bucks County, demonstrated the special fluorescent characteristics of certain rocks found quite close to home. Ralph, also known as the “Glowfather” throughout the mineral world, informed everyone that the nearby mines in the Franklin, New Jersey area are world renown for their varieties and quantities of fluorescent rocks. In fact, the only other place with similar deposits exists in Sweden, but the rocks there are not quite as bright. Ralph has been fascinated almost all of his life by the ordinary-looking rocks with the ability to glow under ultraviolet (“black”) light, and he explained the various properties in different rocks that give rise to the fluorescent characteristics and showed the beautiful colors and patterns his samples exhibit. Ralph has been the organizer for many years of an annual fluorescence rock show at the Fairless Hills United Methodist Church. To experience first-hand the world-famous New Jersey mineral deposits go to http://sterlinghillminingmuseum.org/ for more information. 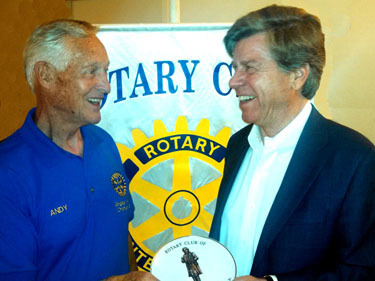 Dinner speaker was Rotarian Denny Lanctot, Esq. who explained the basics Estate Planning, Wills and Powers of Attorney that one should know about. 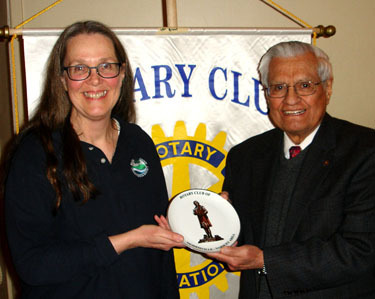 Vice President Barbara presented a Robert Morris commemorative plate to Denny in appreciation for his talk to the club. Denny advocated keeping wills and Powers of Attorney in a safe place but noted that safe deposit boxes should be used only for wills, not Powers of Attorney. The reason is that the law requires bank to open boxes only to look for wills, not for Powers of Attorney. Named executors should be told of the location of a will and agents the location of Powers of Attorney. Other information he shared: Copies of wills cannot be probated, so if the original is lost or destroyed, it will have to be retyped and signed. Do not write on or un-staple an original will. Review ones estate plan from time to time and revise if an intended beneficiary or executor has died. He noted that the main purpose of General/Durable Powers of Attorneys is to avoid guardianship litigation. The Power of Attorney is effective when signed but is not intended to be used unless the principle party becomes incapacitated. A healthcare Power of Attorney designates an agent only when the principle is unable to make decisions and the authority is governed by the living will section of the healthcare Power of Attorney. Denny can be reached at 215-946-4342 or at dlanctot@ccblaw.com. Meghan Sinback, Youth and Teen Services Director, spoke of the services provided by the Lower Bucks Family YMCA and emphasized that it is not just a gym. It has served the community since 1935 and operates four branches; Morrisville, Newtown, Bristol and Fairless Hills. The focus is on Youth Development, Healthy Living and Social Responsibility and it serves the families of Lower Bucks to create relationships and offer programs that provide a healthy start for children, growth for youth and teens, wellness for adults, and unity for families. No one is turned away for not being able to afford the services. Hence the importance of supporting the annual fund drive. While the Y is a United Way supported organization, its needs exceed that funding. Meghan noted that the staff itself is always very generous because the members really believe in what they are doing to help people. The staff has consistently exceeded its own fund-raising goals, contributing 114% of its goal last year. 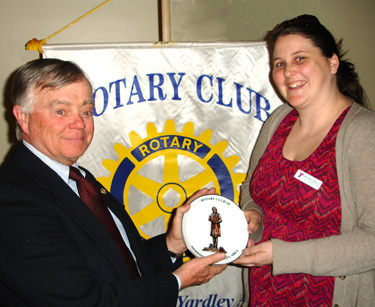 Vice President Tom Mack presented Meghan with a Robert Morris Commemorative plate in appreciation of her talk to the club. For more information go to www.lowerbucksymca.org.